Orlando, Fla – Just as one nurse gently placed a mask on 8 year old Calvin Barr to administer anesthesia before his spinal surgery recently, another quietly stepped to the foot of the bed and snapped a photo of him with a smartphone. Calvin playfully squinted at the nurse with the phone and through the clear blue mask you could see a faint smile. A few seconds later in a waiting room down the hall, Emily Barr’s smartphone chimed, indicating she’d received a text message. It was the photo the nurse had just taken of her son Calvin. After seeing it, Emily smiled herself. 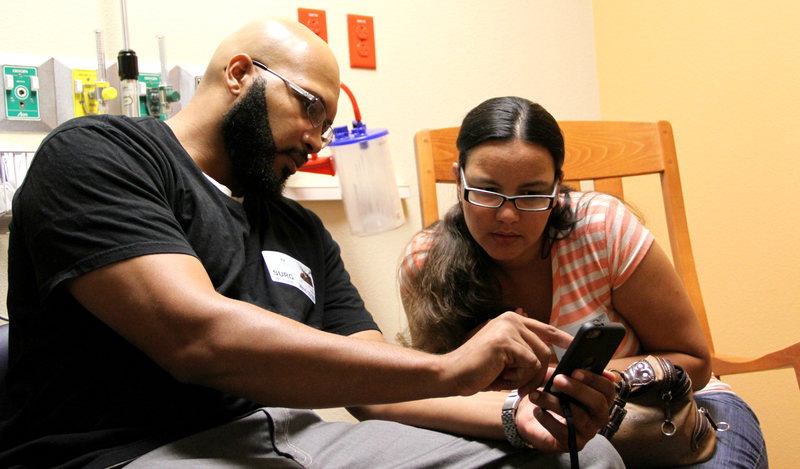 Over the next three hours at Arnold Palmer Hospital for Children in Orlando, Florida, Emily and her husband Calvin Barr, Senior, would receive a half dozen more texts. Some were just a sentence or two updating Calvin’s status, others contained photos or videos explaining exactly what doctors were doing during different phases of his surgery. “I admit I wasn’t sure about the idea at first,” said Mrs. Barr, “but being able to get that information has been very good. We could see what was going on and constantly knew his status and that’s been very reassuring to us,” she said. 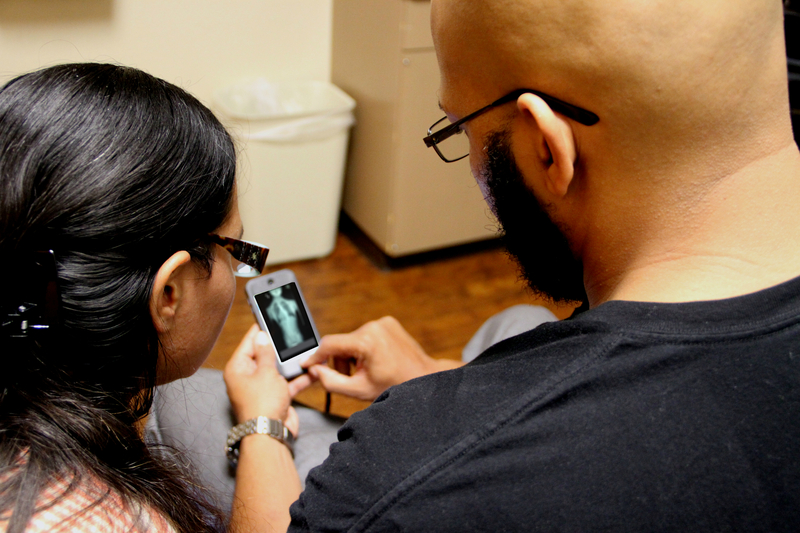 The Barrs are among the first to take advantage of a new app which feeds information from the operating room directly to the smartphones of a patient’s family and loved ones. 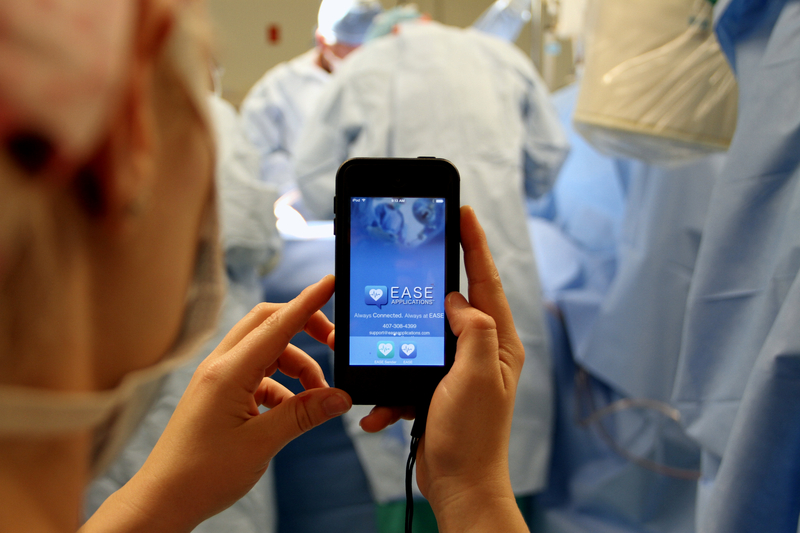 It’s called EASE, which stands for Electronic Access to Surgical Events, and is designed to do exactly what its name implies – ease the minds of those who are waiting and worrying about a child who’s undergoing surgery. “Some of these procedures can go on 4 or 5 hours and that can be really tough to deal with unless you’re getting decent information all the time,” said Dr. Jonathan Phillips, the pediatric orthopedic surgeon who performed Calvin’s operation. 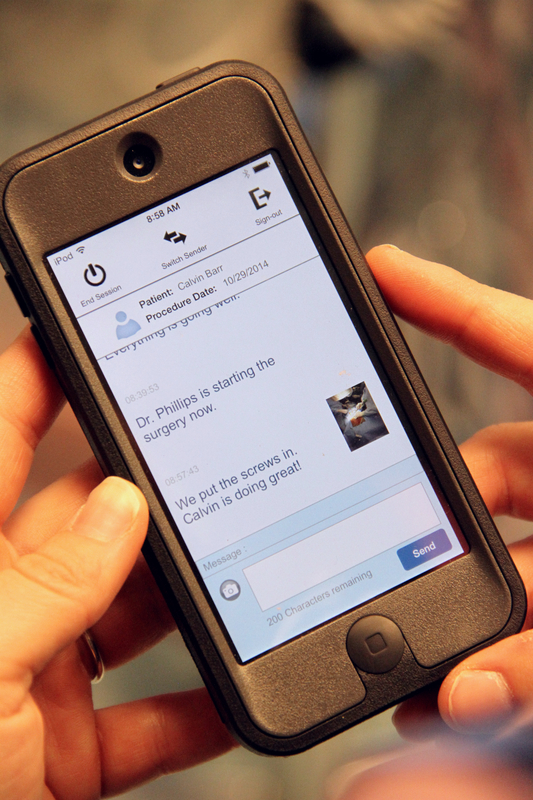 “This app has really made a huge difference in the way we communicate during surgery,” he said. So de la Roza teamed up with Dr. Hamish Munro who knew privacy for the patient was just as important as the information they were hoping to share with loved ones. “We use 256 bit encryption for all messages both in transit and at rest,” said Dr. Munro, which is the same level of security used in mobile banking transactions. “We also control user access, which means only the hospital can authorize people to use the app and we all have special training to make sure we’re in compliance with HIPAA,” he said. Also, like the popular photo-sharing application Snapchat, all messages and images sent through EASE are automatically deleted within 45 seconds. 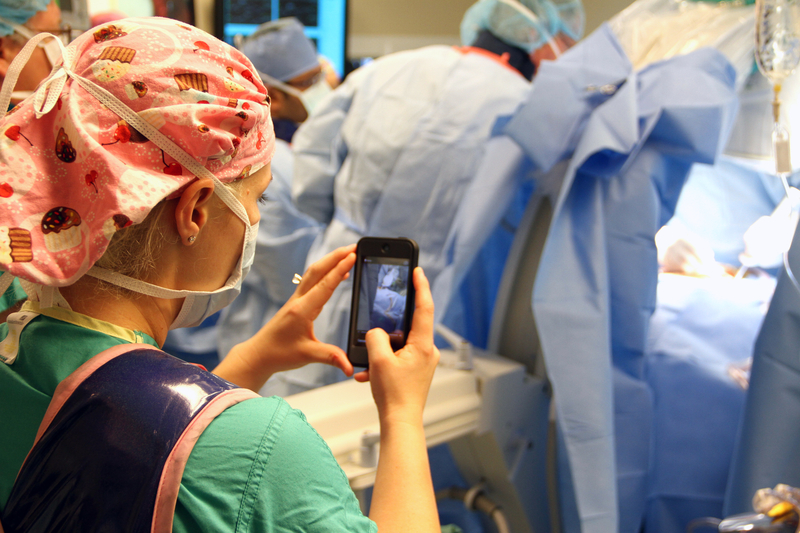 Inside the OR, developers have taken steps to make the use of the app as seamless and inconspicuous as possible. 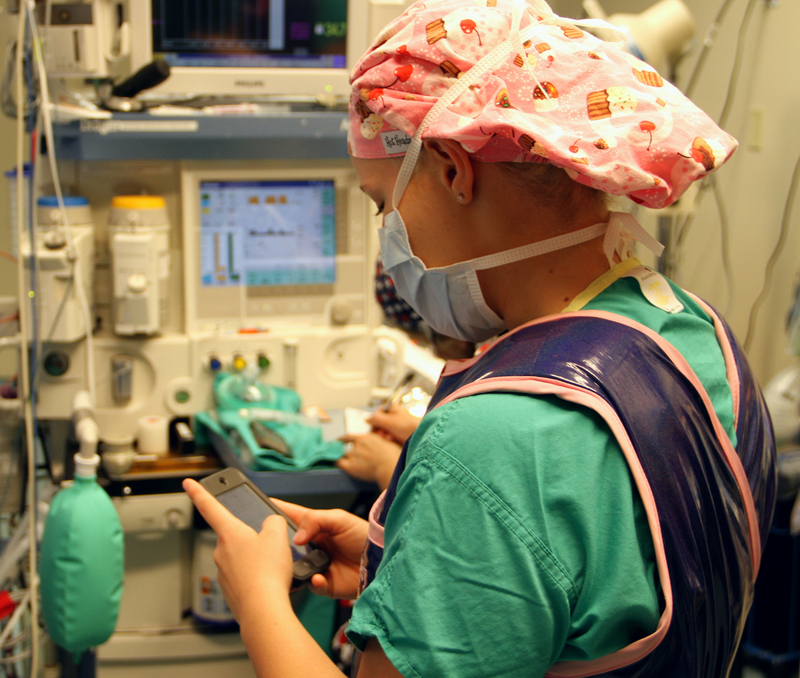 For each operation, a circulating nurse is assigned a phone and is responsible for keeping track of the progress of the surgery and keeping the family informed. Since the messages and images are sent directly to smartphones, that means family members don’t have to sit in a hospital waiting room to get information. In fact, by downloading the app, updates can be sent during surgery to family members or loved ones anywhere in the world. So far, reaction has been overwhelmingly positive. 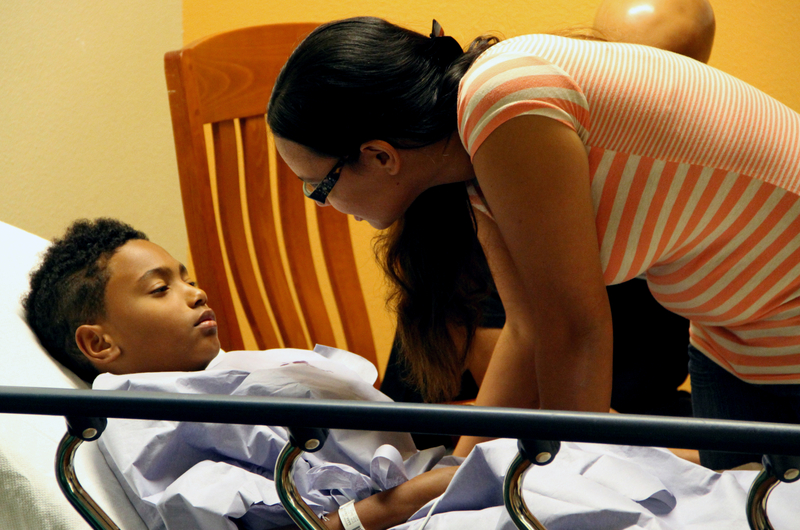 “Pictures speak a thousand words and videos can speak a million,” said Dr. de la Roza. “We’ve found the families just love being involved with this because it’s very educational. It’s the fear of the unknown that we’re answering for them,” he said. About Arnold Palmer Hospital for Children – Arnold Palmer Hospital for Children, supported by the Arnold Palmer Medical Center Foundation, is a 158-bed facility dedicated exclusively to the needs of children. Located in Orlando, Arnold Palmer Hospital provides expertise in pediatric specialties such as cardiac care, craniomaxillofacial surgery, emergency and trauma care, gastroenterology, nephrology, oncology, orthopedics, pulmonology and sports medicine. Visit www.arnoldpalmerhospital.com to learn more about all of our specialties.